Palo Alto Software has been actively involved in the SBDC world for 20+ years. LivePlan, our flagship software, was designed to help the types of clients whom SBDCs work with on a regular basis. It is an effective way to help small businesses pitch to investors, write a bullet-proof business plan, and keep track of as well as be able to forecast financials. The goal of this competition is to familiarize SBDCs nationwide, with the LivePlan software and the “lean planning” approach while also giving them the opportunity to win over $20,000 in cash and prizes to help further office goals and reach. Along the way, Palo Alto Software will provide free webinars that include small business tips and advice on the most effective ways to use LivePlan with your clients (you can register below). To ensure you are eligible for the competition, participants are required to complete and submit the “Pitch Page” feature on LivePlan. Most offices have redeemed the 3 free LivePlan licenses donated by Palo Alto Software, but if yours has not, email LivePlan at executives@paloalto.com to get set-up. 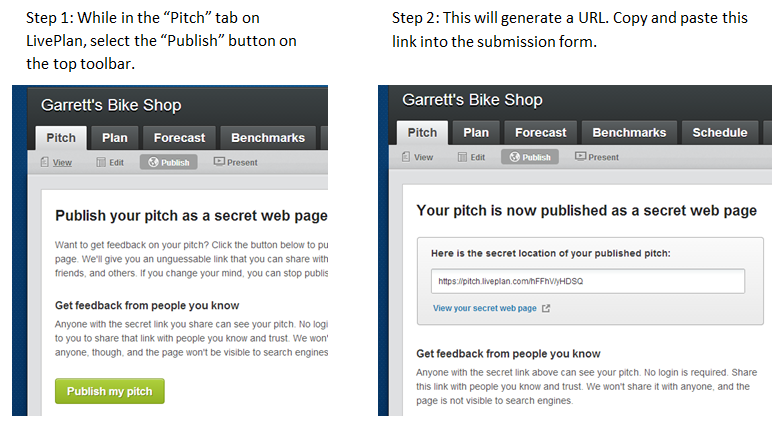 Once you have completed the Pitch Page, publish your pitch, and copy the URL into this submission form. For help publishing your page, see the images below. Note: If you make any changes to your page after submission simply click the “Update it now” button on the Pitch page and it will automatically update the URL/link. The first webinar will be held on Wednesday, July 16th from 10:00AM to 11:00AM PDT. To register and learn how to prepare your pitch, follow this link.